This month's challenge was pavlova American style. I say this because the challenge recipe produces what in Australia is called a meringue. I did the challenge recipe but I also included the classic Down-Under (Australian and New Zealand) pavlova version and recipe also. 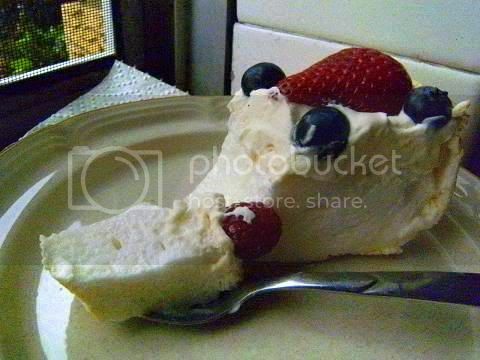 This challenge is close to the heart's of bakers from Down Under (Australia and New Zealand), pavlova is the national dessert for both countries. I had all the ingredients in the refrigerator and I had made crème anglaise for another dessert I was making so this challenge was a breeze. I have made literally 100s of pav's and they are always a great hit at the end of a dinner party. 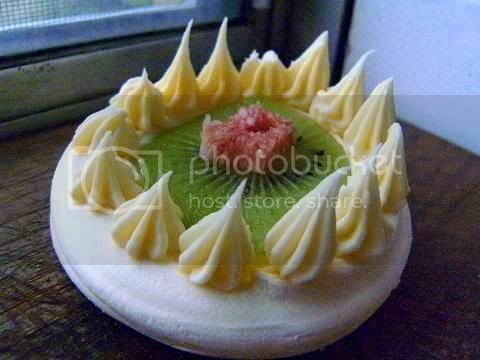 Usually pavlovas Down Under are decorated with whipped cream and fruit (passion fruit, kiwi and strawberries) so it is nice to have a challenge using another decoration. I have several children's parties to do this month so I thought I would do a pavlova roll (as a change) for the adults attending – I followed the recipe but used a Swiss (jelly) roll pan to make the pavlova, to make a roll just bake for about an hour that way the meringue is set but no crust is formed so you can roll it easily with the mascarpone cream and mousse filling. The essence of a pavlova (at least Down Under) is that the inside must be light as possible like marshmallow the crust is thin and crisp and it is decorated with fruit and whipped cream. 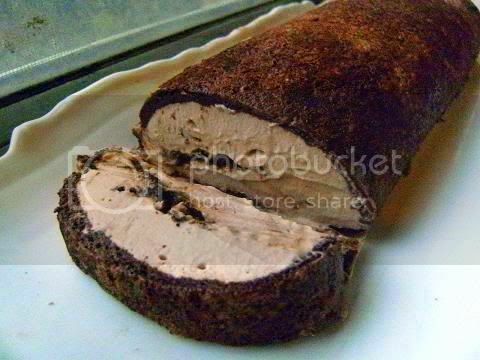 I flavoured the mousse and the outside of the roll with cocoa powder, good quality instant coffee, brown sugar and hazelnut meal. The meringue in the roll is very soft and paired with the flavoured mousse and mascarpone cream really makes for a rich, wonderful and tasty dessert. For children leave out the coffee you really don't want to have caffeine in a dessert for children at a party where there is already enough sugar and stimulation to have very energetic kids running about madly. I'm very pleased with this pavlova roll the first I have made it was so soft and the texture was so light and the flavour was intense. Chocolate Coffee Hazelnut Pavlova Roll – it looks so pretty and elegant. Maybe some mousse curls with hazelnut meal on top would make it look smashing. 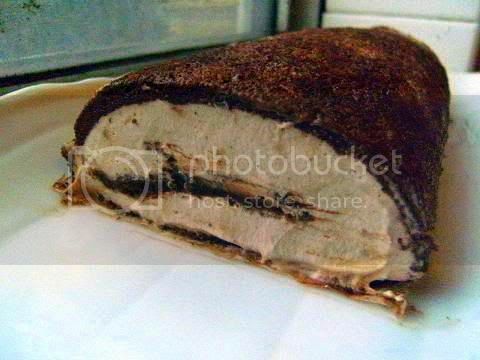 The cut pavlova roll – the pavlova is the dark chocolate coloured layer, the mousse/mascarpone cream filling is the light brown layer. Notice how soft the roll is perfect for children. 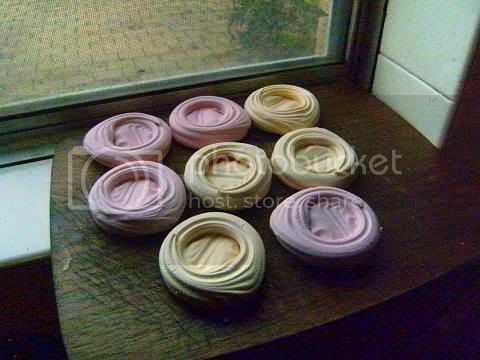 I decided to do fruit flavoured pavlova shells I did strawberry and passion fruit – I used powdered fruit powder to colour and flavour the meringue (I used 1/3 cup of powder for each batch). Then I made homemade white chocolate mascaropne this was so delicious it had the perfect balance between of sweet, tart and mouth-feel so so yummy. To make the fruit meringue shells I used all glucose syrup instead of caster sugar and icing sugar - this makes of an absolutely smooth shell when baked and makes the meringue more stable also I used finely strained 'fruit' tea powder found in the health food section of the supermarket. Use a coffee grinder to make a very fine powder first then strain again to get a fine powder like corn starch. To form the shells I made a 'gig' using cardboard and thumb-tacks to form the circular shape. And to pipe them I used two piping tips a big flat shaped one to do the bases and then I used a large flat serrated tip to make the rim, if you use the 'gig' on a Lazy Susan you can get the same looking result (almost identical) every time. I used coloured thumb tacks to start and end at the same place when piping which gives a very professional look. Also I have a professional grade oven which goes down to a very low temperature that is steady and constant which helps to make the meringues crisp without browning. 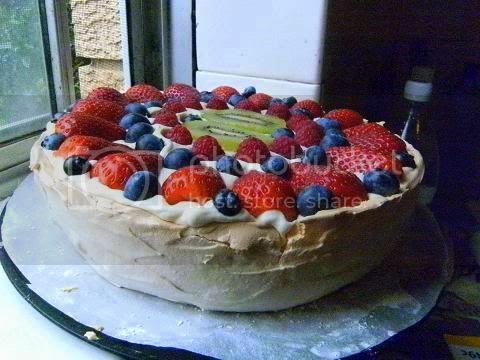 I had to do a classic Australian pavlova for this challenge. It is astounding that using the same base recipe with slightly different techniques can you achieve totally different results. Viz-a-viz the challenge recipe as stated gives what is called meringues in Australia they are dry and crunchy all the way through while the Aussie pavlova has a very thin crust that is dry and crisp while the inside is soft and chewy like the lightest marshmallow you have tasted – this amazing difference is achieved by making just a few simple changes in the method for making the challenge recipe. 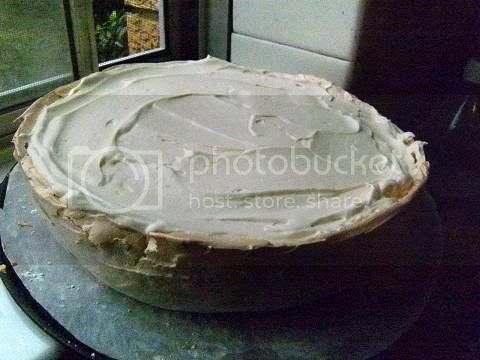 Basically you make one giant meringue cake, preheat the oven to 200C (395F) and immediately once the meringue is in the oven lower the temperature to 95C (205F) and bake for about 1¾ hours. Use a 8” (20cm) x 2.5" (60mm) springform cake tin without a bottom as a container to hold the whipped egg whites. I used 6 egg whites and 1 1/3 cups of castor sugar, add and beat one tablespoon of sugar into the egg whites until all the sugar is dissolved this takes about 12 mins. 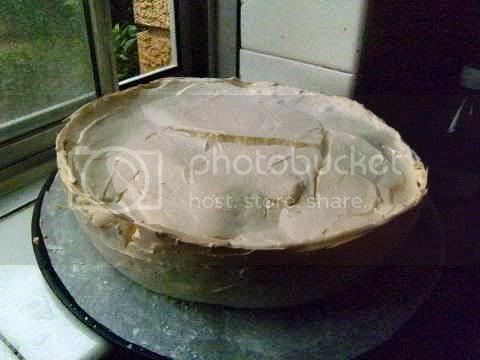 Remove the springform cake tin and you will have one giant uncooked meringue. Preheat the oven to 200C (395F) then immediately lower the oven to 95C (205F) and bake for 1¾ to 2 hrs, you can test readiness by tasting a teaspoon of the cooked meringue from the top (don't worry you will not notice the small hole caused by the testing) if it doesn't taste of egg then the pavlova is ready. Turn oven off and let the pavlova cool in the oven until room temperature. It is normal to have a few cracks on top these will be covered with the topping so will not be seen and it is normal for the crust to be lightly browned. The initial high temperature makes for a thin crisp crust while the low temperature ensures the interior is soft and fully cooked. 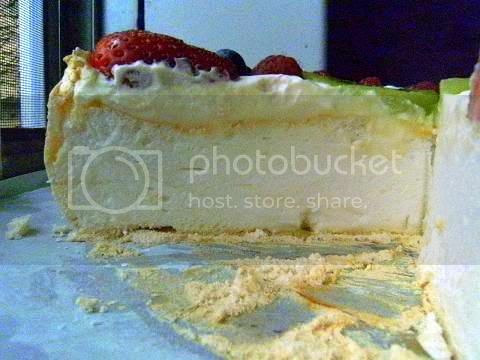 Cover the top of the pavlova with whipped cream or similar I used homemade white chocolate mascarpone cheese with cream. 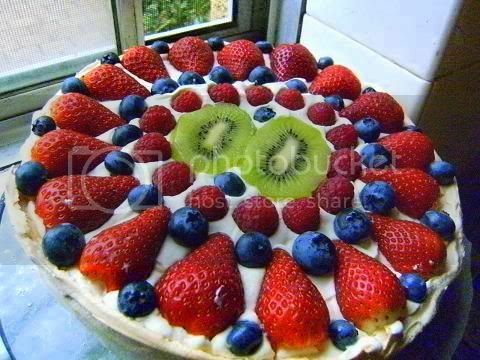 Then decorate with fresh fruit make sure the pattern is arranged so that slicing the pav will be easy. 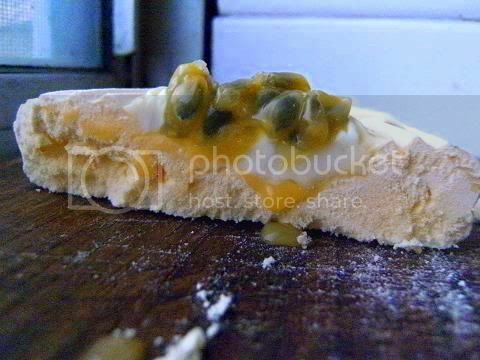 What is the texture of a classic Australian pavlova – thin crisp crust and a soft chewy marshmallow inside. 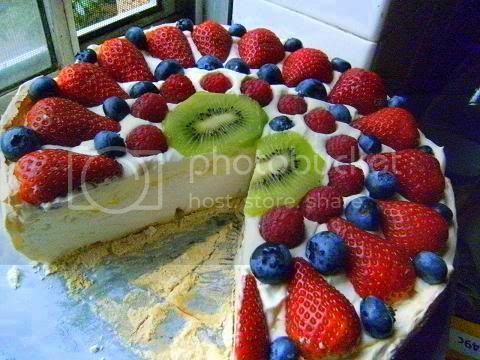 You should be able to hear a crack from the crust when you slice the pav. You should be able to poke the soft marshmallow interior with your finger and it should leave a hole. And you should be able to cut it cleanly however thin the slice is! 1. Preheat oven to 200°C (395°F). Dust lightly with 1 teaspoon cornflour a sheet of baking paper place on a baking tray. Place a 8” (20cm) x 2.5" (60mm) springform cake tin without a bottom as a container to hold the whipped egg whites on the floured baking paper. 2. Using an electric mixer on the highest setting, beat egg whites and cream of tartar (or salt) in a narrow deep bowl until soft peaks form (using a narrow deep bowl ensures the beaters are well into the whites and will build up the greatest volume). Add sugar, 1 tablespoon at a time, beating constantly until thick and glossy. Add remaining 3 teaspoons of cornflour with the last tablespoon of sugar. Dissolving the caster sugar should take about 10-12 mins if using normal granulated sugar about 15 mins. 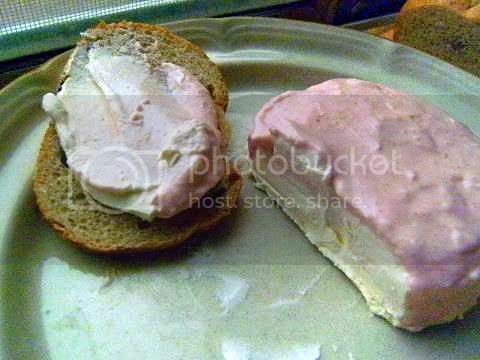 (Test mixture by feeling a small amount of the meringue between two fingers if it is grainy beat longer.) Fold through vanilla and vinegar. 3. Spoon meringue into the springform cake tin. 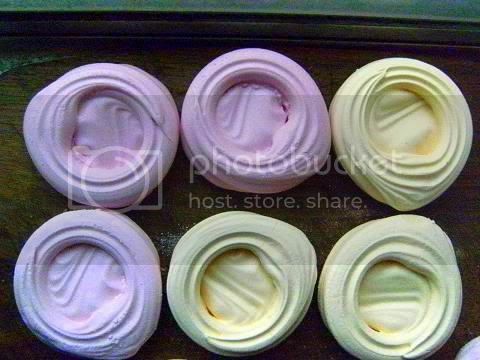 Shape the uncooked meringue using the springform cake tin as a guide into one giant meringue. 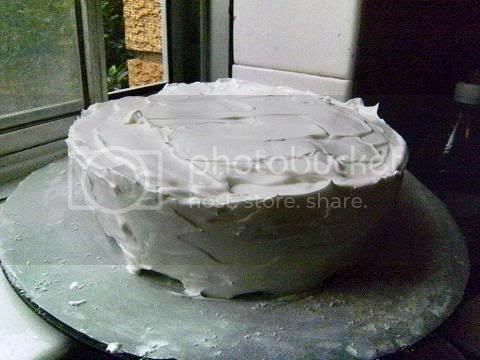 Remove the springform cake tin and place the uncooked meringue cake into the oven. Reduce oven to 100°C (212°F). 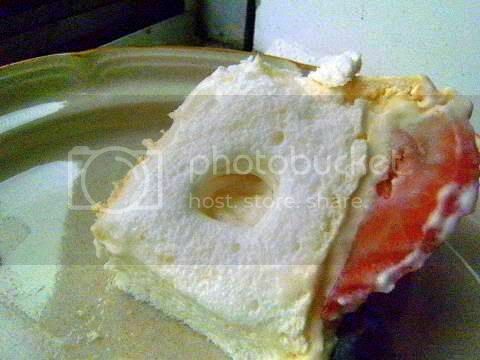 Bake for 1½ to 2 hours or until dry and crisp, test by tasting a teaspoon of the meringue from the top if it doesn't taste of egg it is done don't worry about the small hole made by this testing it will be covered by the topping. Test at 1½ hours and then every 15 mins until ready. Turn off oven and cool completely in oven (pavlova may sink and crack during cooling). If you wish you can add some sugar to the whipped cream I recommend this for U.S. bakers I notice most U.S. recipes are sweeter than Australian ones. You can add up to 1½ cups of caster sugar or normal granulated sugar in the meringue if you wish. Just test a small amount of the uncooked meringue if not sweet enough add more sugar. You can use normal granulated sugar but it will take longer to dissolve the sugar into the egg whites about 15 mins again test mixture by feeling a small amount of the meringue between two fingers if it is grainy beat longer. Icing sugar (powdered or confectioners' sugar) doesn't seem to work well with this recipe the interior becomes too dry. 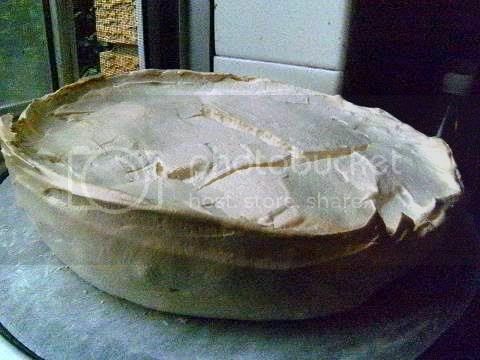 You can make the pavlova when it is raining, high humidity doesn't affect the pavlova shell. 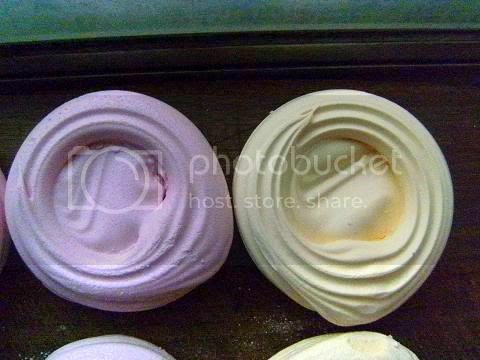 Unfilled pavlovas store well for 2-3 days in an airtight container on the counter. Decorate the pavlova about an hour before using and they will be ok for 8 hours so long as it is not too hot (as the cream might go off), I have stored (in the fridge) decorated pavlovas for a day with no problems. *When separating the whites from the yolks, be careful not to include even the smallest amount of yolk – the fat content in the yolk will prevent the whites from foaming. Always break the eggs separately into a cup before adding to the bowl for beating. *Use a small deep bowl to beat egg whites – this ensures the beaters are well into the whites and will build up the greatest volume. 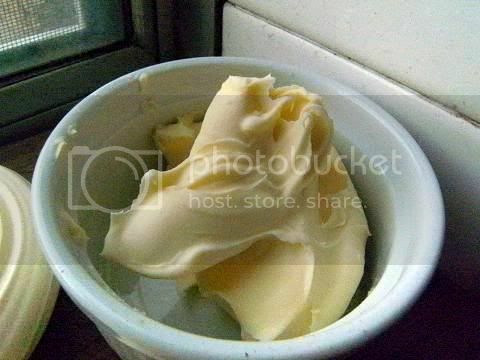 *Make sure the bowl is dry and clean – any greasy residue in the bowl will prevent egg whites from beating up. *Beat egg whites at highest speed until thick and white, but not dry. When they look glossy and have firm, soft peaks add sugar. If whites are beaten until they are dry, it is more difficult to dissolve the sugar. 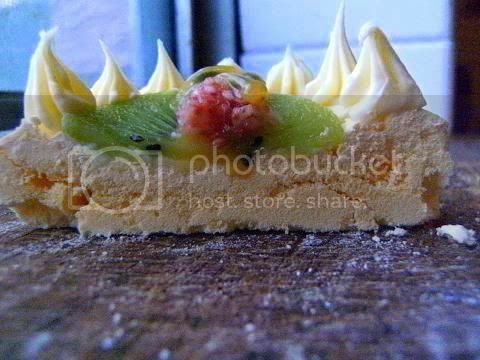 *Use castor sugar in pavlovas as it will dissolve faster than granulated sugar. *Sugar grains can be felt by rubbing a small amount of meringue mixture between fingers. *Make sure that there are no sugar grains around the top of the beaters or around the sides of the bowl, scrape the mixture down the bowl with a spatula. Keep beating on high speed while adding the sugar. *Total beating time should be about 10 minutes, to ensure every grain of sugar is completely dissolved. 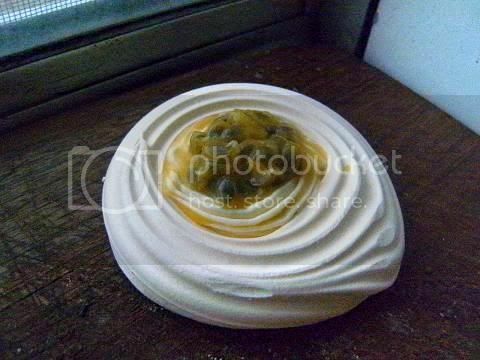 *Cool the meringue in the oven with the door ajar, if meringue is cooled too quickly it can crack. You can omit the sambuca from the mascarpone cream. You may substitute any crème anglaise recipe you might already have in your arsenal. While the pavlovas are baking, the crème anglaise should be made which will take about 15 minutes. While it is cooling, the chocolate mascarpone mousse can be made which will take about 15 minutes. There will be a bit of a wait time for the mascarpone cream because of the cooling time for the Crème Anglaise. If you make the Crème Anglaise the day before, the dessert should take about 2 hours including cooking time for the pavlovas. 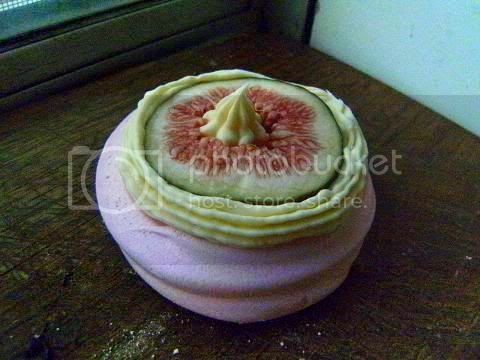 Beware many offal and animal body part photos are contained in this post so be warned! 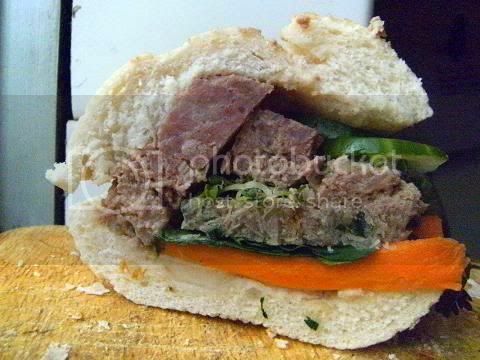 This month's challenge was brilliant it was to make pâté and bread to go with it. 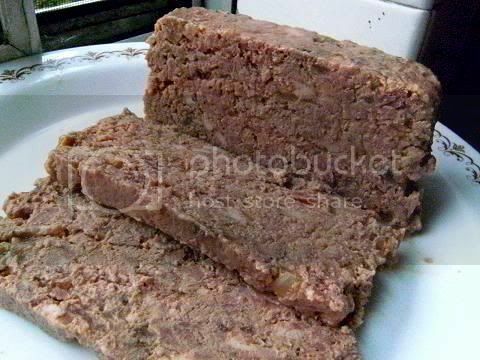 What was so special about this challenge was the exquisite taste of the offal pâté - liver and other offal are used to make pâté but in pâté the offal changes in character so much - a lot of people dislike cooked kidney or other offal but when cooked into a pâté it is so tasty and full of flavour. The three spice chicken liver pâté (one of the challenge recipes) was a revelation to me and many other Daring Cooks'. I love offal and did many versions of offal pâtés. 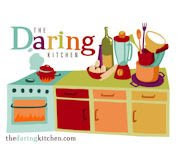 It was so nice to have a chance to do offal for the Daring Kitchen. 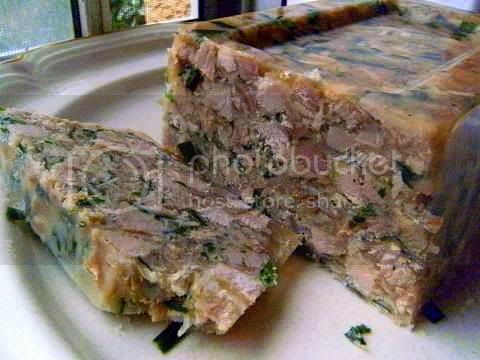 Traditionally, pâté is meat-based, and often includes liver, or gizzards, or other potentially icky animal parts. But, because we realize that not everyone likes that kind of pâté, we have also included recipes for fish pâté, and vegetable pâté. However, if you know that you enjoy liver pâté, but are a little squeamish about cooking with liver, we urge you to give it a try: after making these, neither of us will ever buy meat-based pâté ever again! Having said that, the meatless pâtés are also very tasty. Now, since pâté is rarely eaten alone, we are adding a second part to this challenge: you will have to make a bread, to go with your pâté. We’ve included a really good recipe for French baguette. However, because baguette is quite time-consuming to make, and because we know that the Daring Bakers have already made baguette a while ago, we’re also giving you a quicker recipe for a sandwich loaf, which you can also choose to make as little rolls, with white or whole wheat flour. But really, we’re giving you free range for the bread part of the challenge: if there’s a daring bread recipe you’ve been dying to try, and you think it would go well with your pâté, go for it! 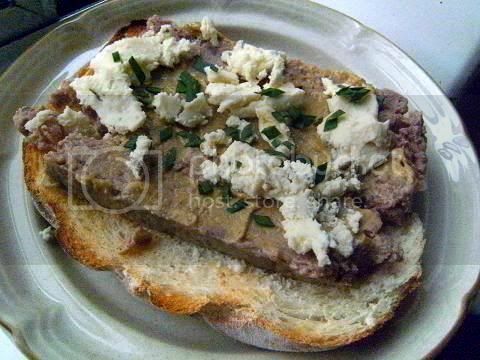 - Three Spice Liver Pâté: adapted from Ravenous Couple, which was inspired by White on Rice Couple. Blog-checking lines: Our hostesses this month, Evelyne of Cheap Ethnic Eatz, and Valerie of a The Chocolate Bunny, chose delicious pâté with freshly baked bread as their June Daring Cook’s challenge! They’ve provided us with 4 different pate recipes to choose from and are allowing us to go wild with our homemade bread choice. I decided to a very yummy recipe from a very old Finnish cook book that my mum give me it is 113 years old. The name of the recipe means Poor man's Goose Liver Pâté it uses ground tripe as the bottom layer and has a fruit (I used pomegranate the recipe said to use cranberries) topping. The resulting bottom layer of tripe pâté was surprisingly very white (I was expecting pink since tripe usually goes pink when cooked) and the pomegranate topping went superbly with the pâté it really complimented the richness of the tripe. I did cranberry sourdough short rolls which worked out very well and cut very cleanly. I'll spare you pictures of tripe and the process of making it. I had invited a few friends whom I knew would like offal pâté. 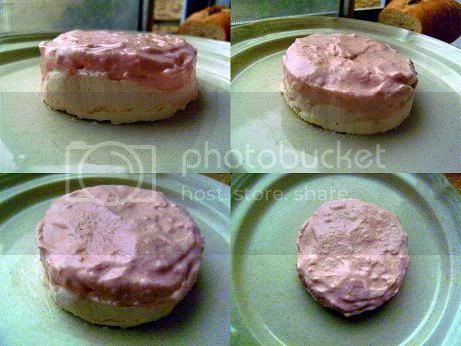 The texture was exquisite like firm brie and it was all eaten up in no time - barely enough time to take the photos. It had a very strong taste of goose which was very unexpected but delicious. A very interesting and intriguing recipe and one which I will do again. The recipe uses only a few ingredients I think it really was a recipe for poor people to cheaply recreate a rich strongly goose liver flavoured pâté. 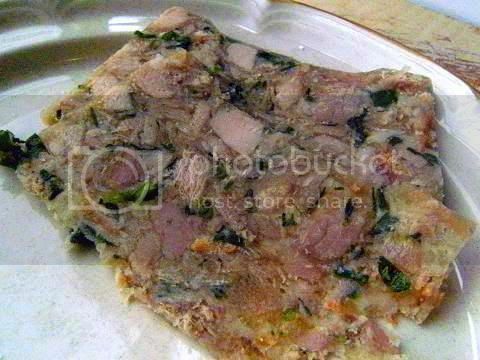 The first pâté is brawn or pâté de tête de porc it is made from pig's trotters and a pig's head. The second pâté is the challenge chicken liver recipe but with a lot of hot chillies added. Absolutely delicious it was so shiny and the chives added a lovely colour and flavour. The chillies (hot Thai) really added a wonderful flavour punch to the pâté. 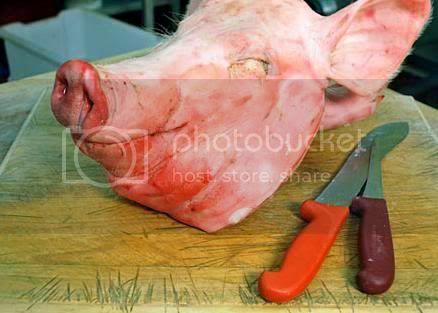 Place the washed and dried pig's head and trotters into a large stock pot. Add all the ingredients except chives and seasoning into the pot with enough water to cover. Slowly bring to boil lower heat to a low simmer and cook for 3-4 hours until the meat falls off the bone, top up water and skim as necessary. Let cool for one hour. Pick all usable meat from the head and trotters, chop meat into ½ cm pieces and place into a large bowl, strain liquid through a fine sieve into the bowl, discard everything else. Return meat and liquid to the pot and simmer for 10 mins. Let cool to warm add chives and check for seasoning adding sugar, salt and pepper as needed. Remember this dish is served cold so over-season slightly. Pour into moulds and refrigerate overnight. The skinned tongue (chopped) and the ears (finely sliced) are especially delicious so use them also. Remove the eyes and other nerve tissue when picking the head clean. The brains (mashed) are heavenly with tarragon, butter and Dijon mustard you can use this as a dressing for the cut slices if you wish. Luxury variation – add hard-boiled eggs (quail or halved-chicken) into the moulds with the above completed recipe. The butcher give me a pile of lamb's and small pig's tongues for free so I had to make sliced tongue - the recipe is so simple just boil the tongues in half water and vinegar for 3 hours (check after 2 hours) skimming as necessary. Cool and skin the tongues. Reduce the simmering liquid to one cup. 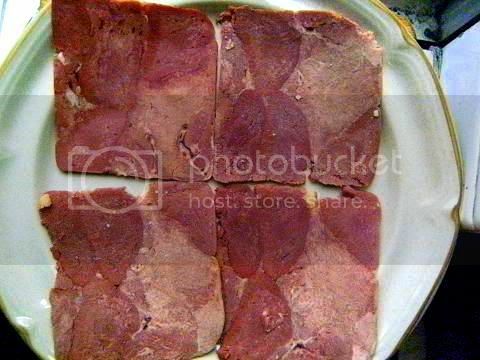 Place the tongues tightly packed into a loaf pan with the simmered liquid, weigh down the meat and refrigerate overnight. The final recipe can be sliced thinly. I'm really loving this challenge I just love offal. 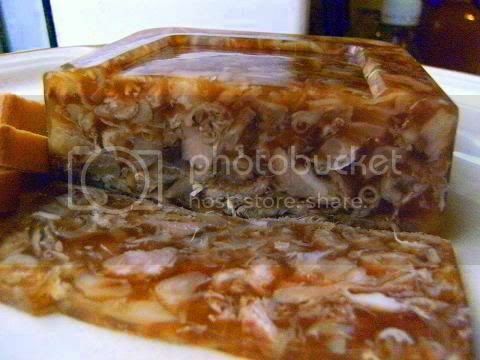 I just realised that I have made pâté from cow tripe, chicken liver, pig head and trotters, and finally lamb and pork tongue - I will have to think hard what to make next I'm not sure if there is other offal left LOL LOL! 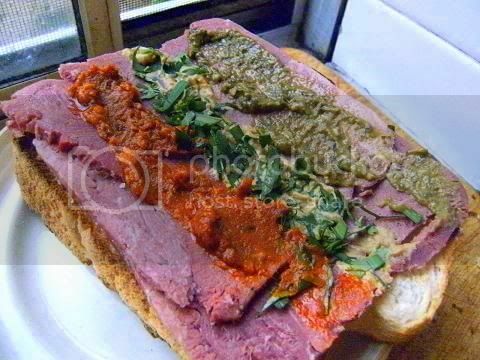 Tongue sandwich - red semi-dried tomato pesto, mustard with herbs, green basil pesto. Yum Yum. 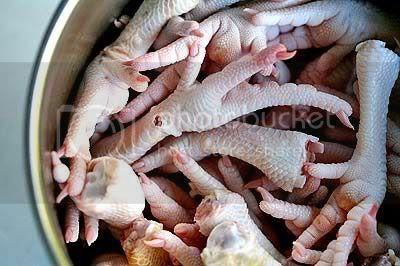 I like the head cheese pâté so much I thought I would a chicken feet version. It is the same basic recipe just simmer the feet for 4 hours and pick the meat from the bones and reduce the stock to about 1 litre (4 cups). I also made "French toast" to go with the pâté. These recipes were such a pain to make - the chicken feet had a lot of very small bones that I had to push the meat through a sieve to get rid all of them and the bread took several hours of careful watching much easier to buy a pack for $1. But I gained a lot of experience in learning what to buy and what to make from scratch. They did taste good so it was worth it in that sense. Another tip that might be helpful I was researching pâté making and I was making the challenge recipe and found that 'normal' bacon can very very salty so it is best to use uncured bacon if you can get it luckily I used uncured bacon anyway and found the seasoning to be correct after I did the poach test. - For all pâtés: We have each worked with various sizes and shapes of baking pans. We have indicated the size of the pans we used, but feel free to adapt the quantities to the bake ware you have on hand. - After baking the Three Spice Liver Pâté, Chicken Liver Pâté and the Trout and Shrimp Pâté, when taken out of the oven they had all shrunk slightly, and they were swimming in liquid fat. The longer you allow the pâtés to cool, the more the juices will get soaked in the pâté. When removing from the mold, drain the excess fat. 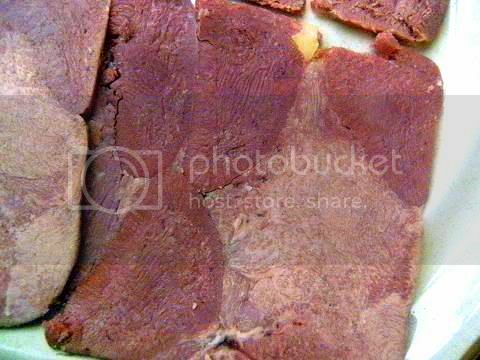 You can also drain some of the fat before unmolding, but keeping mind your pâté may be a littler drier. 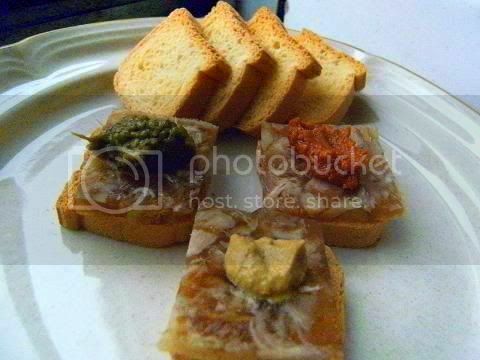 - Chicken Liver Pâté and Trout Pâté: These recipes involve flambéing ingredients with alcohol. This actually adds a lot of flavor to the dish. However, if you do not wish to consume alcohol, or if you are uncomfortable with flambéing, you can omit this step. IMPORTANT PRECAUTION: When flambéing, make sure to always keep an airtight lid within your reach, in case you need to put out the flames quickly. 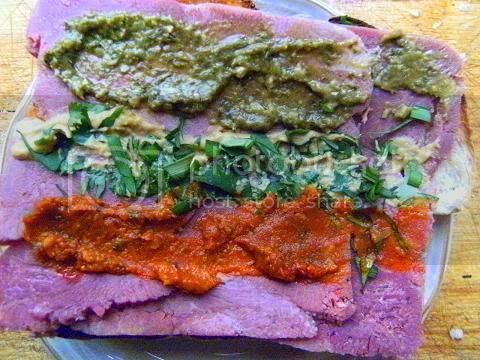 - Tricolor Vegetable Pâté: Refrigerate as long as possible, min 8 hours. Freeze it 30 min before unmolding. - French Baguette: Use the lesser amount of water in summer (or in a humid environment), the greater amount in winter (or in a dry climate), and somewhere in between the rest of the year, or if your house is climate controlled. Spritz the baguettes heavily with warm water; this will help them develop a crackly-crisp crust. 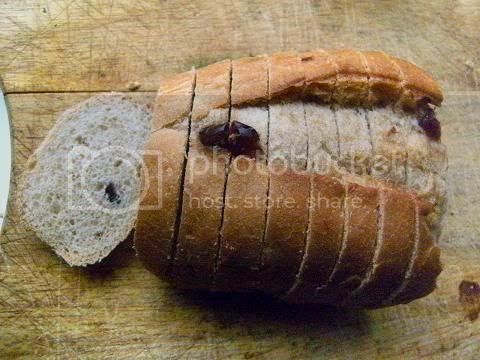 - Sandwich Loaf: We only made the whole wheat version of this bread, and the little rolls where tested, rather than two large loaves. However, they were perhaps a little heavy. If you want to make the whole wheat version, but prefer soft, light bread, you may want to use half white flour and half whole wheat (or use a two-to-one ratio, it’s really your choice). 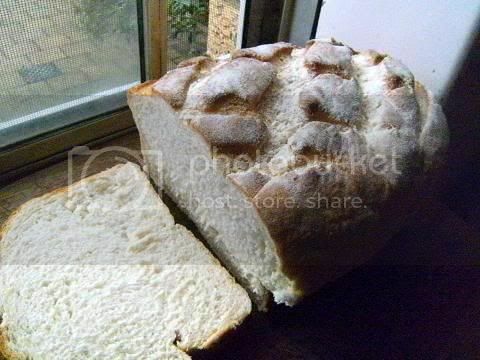 You can also halve the recipe and just make one loaf. - What to serve your pâtés with, besides the bread? How about some pickles, cheeses, grapes, or an onion confit. Let your imaginations go wild! Variations allowed: You may choose from any of the recipes below for the pâtés. 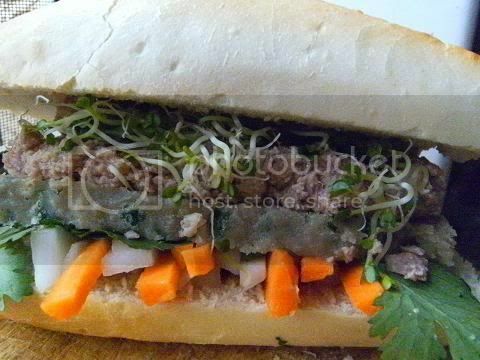 We have included a chicken liver, fish/seafood, pork and vegetarian recipe. I believe they are all gluten free (correct me if I am wrong). The pork one is dairy-free. Vegans and those with food restrictions can find a substitute recipe as the vegetarian one has cheese. 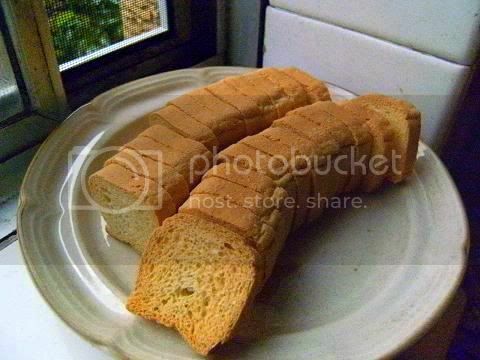 For the bread, you can choose any recipe you like if you do not want to make the French Baguette or the Sandwich Loaf. 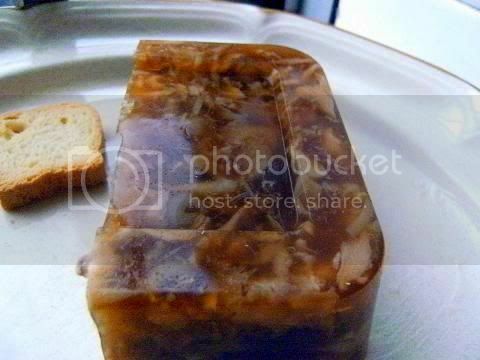 -You must prepare one pâté recipe listed below (exceptions are allowed for participants with food restrictions, and vegans may choose their own substitutions) and one bread recipe of your choice. 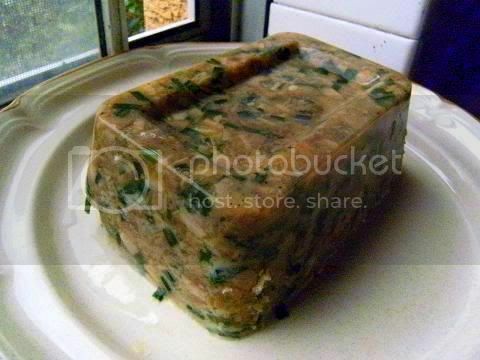 - Your pâté has to 1) be baked or refrigerated (or both) for a significant amount of time, so that 2) you have to be able to unmold it onto a serving dish. This is to avoid the possibility of someone puréeing a bunch of vegetables, putting the mixture in a jar, and calling it “vegetable pâté”: that is not a pâté, that is a spread. Preheat oven to to 350ºF (180ºC). Cut liver and pork fat into small pieces and add to food processor. Add ground pork, garlic, shallots, cinnamon, cumin, coriander, salt and pepper. Grind until smooth. In mixing bowl, incorporate the meat and liver mixture with the cognac and eggs. Line bottom of baking or ceramic pan with overlapping pieces of bacon. Place a bay leaf on the bottom and then fill with meat/liver mixture. Cover top with another bay leaf and then overlapping pieces of bacon. Place in oven in the larger baking pan and add enough water to cover 2/3rds of the pan containing the meat/liver mixture. Bake for about 1-1.5 hrs. The pâté will contract and the juices will be on the bottom. Allow to cool and soak up the juices. Remove any excess bacon and discard the bay leaves. Put the minced pork belly and blade in a food processor, then add the onion-liver mixture and the chopped shallots, and pulse until you obtain a homogeneous mixture – make sure not to reduce it to a slurry. Pour the Grand Marnier over the cooked shrimp. Light a match and carefully ignite the alcohol, to flambé the shrimp. Wait for the flames to go out on their own, carefully tilting the pan to ensure even flavoring. Set aside. Put the trout and the remaining raw shrimp in a food processor and pulse. Gradually pour in the cream and keep pulsing until you obtain a smooth mixture that is easy to spread, but not too liquid (you may not need to use all the cream). Season with salt and green pepper. Butter a 6x3 inch (15x7,5 cm) loaf pan or terrine, then line it with parchment paper. Spoon in half the trout mixture, and spread it evenly. Place the flambéed shrimp on top, in an even layer, reserving 3 or 4 shrimp for decorating. Top with the remaining trout mixture. Put the water bath and terrine in the oven, and bake for 35 minutes. The pâté should be cooked through and firm in the center. 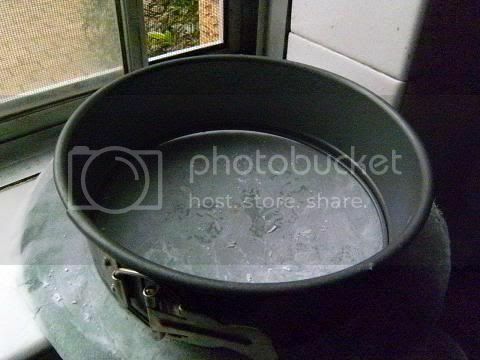 Remove the pan from the water bath and let cool. Carefully unmold onto a serving platter. Decorate with the reserved shrimp, and sprinkle with chopped chives. Cut into thick slices and serve at room temperature, with crusty bread. Mix active dry yeast with the water and then combine with the starter, flour, and salt. Mix and knead everything together—by hand, mixer or bread machine set on the dough cycle—till you've made a soft, somewhat smooth dough; it should be cohesive, but the surface may still be a bit rough. Knead for about 5 minutes on speed 2 of a stand mixer. Working with one piece of dough at a time, fold the dough in half lengthwise, and seal the edges with the heel of your hand. Flatten it slightly, and fold and seal again. 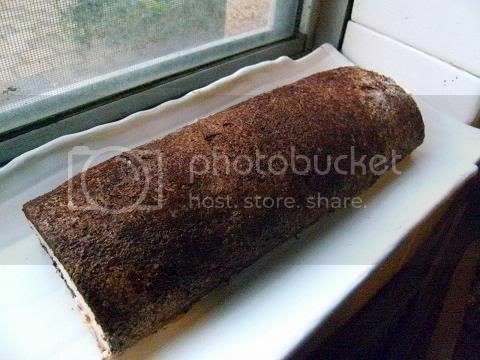 With the seam-side down, cup your fingers and gently roll the dough into a 15" log. Place the logs seam-side down onto a lightly greased or parchment-lined sheet pan or pans. Cover them with a cover or lightly greased plastic wrap, and allow the loaves to rise till they've become very puffy, about 1 1/2 hours. Towards the end of the rising time, preheat your oven to 450ºF (240ºC). 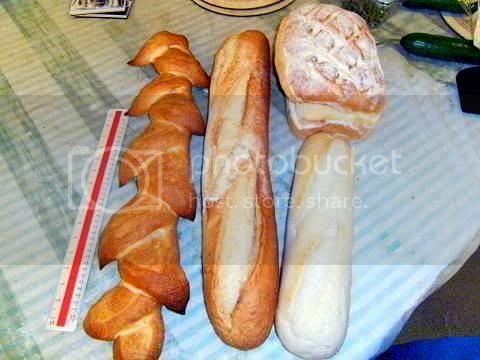 Using a very sharp knife held at about a 45° angle, make three 8" vertical slashes in each baguette. Spritz the baguettes heavily with warm water; this will help them develop a crackly-crisp crust. Bake the baguettes until they're a very deep golden brown, 25 to 30 minutes. Remove them from the oven and cool on a rack. Or, for the very crispiest baguettes, turn off the oven, crack it open about 2", and allow the baguettes to cool in the oven. In a large mixing bowl, combine the yeast and warm milk, and whisk to dissolve. Whisk in the salt and the melted butter. Gradually sprinkle in the flour, stirring with a wooden spoon. When the dough becomes too thick to stir, knead it with your hands, for about 5 minutes, until you obtain a smooth, homogeneous dough that is soft and a little sticky. Cover with plastic wrap and let rest 30 minutes. Knead the dough 20 strokes (still in the bowl), cover again, and let rest for 1.5 hour. Transfer the dough to a lightly floured work surface, and divide in two. Form each half into a slightly oval ball. 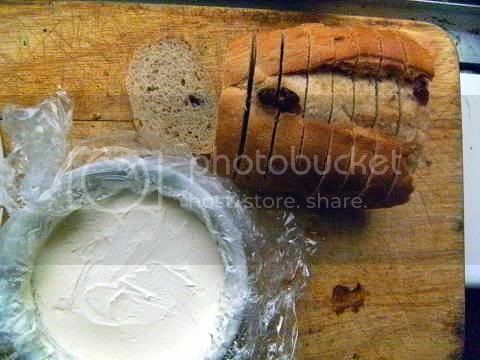 Butter your two loaf pans and transfer the dough to the pans. Cover lightly and let rise in a draft-free area for 60 minutes, or until doubled in volume. Fill a large baking pan with hot water (simmering is fine) and place in the oven. Preheat oven to 450ºF (240ºC). Put the loaves in then oven and bake for 10 minutes. Do not open the oven door during this time. After 10 minutes, lower the oven temperature to 400ºF (200ºC) and continue baking for about 25 minutes, or until the loaves are nicely golden. Unmold and let cool on a rack. Go through the same process as for making the loaves, up until it is time to shape the loaves. Divide the dough into 18 sections, shape each section into a ball, and dust with flour. Butter part of two muffin tins (only butter 18 cavities), and transfer the balls of dough into the cavities. Cover loosely and let rise in a draft-free area for 45 minutes. Fill a large baking pan with hot water (simmering is fine) and place in the oven. Preheat oven to 425ºF (225ºC). Put the loaves in then oven and bake for about 25 minutes, or until the rolls are nicely golden. Let cool on a rack.